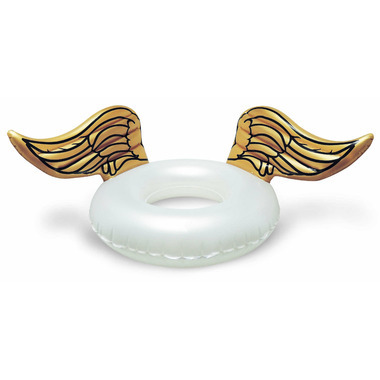 Spread your wings and float your day away on this pretty pool floaty with metallic gold Angel Wings. This inflatable pool toy is made from an extremely durable vinyl. Just in case, it also comes complete with a handy patch kit. Put a smile on any party goer's face when you show off this fabulous float. Great for use in the swimming pool, at the beach, or at the next pool party. This blow-up toy is sure to get lots of attention wherever you float on it! Caution: choking hazard - small parts not suitable for children under 3 years of age. This is an aquatic toy, not a lifesaving device. Do not leave child unattended in water while device is in use. 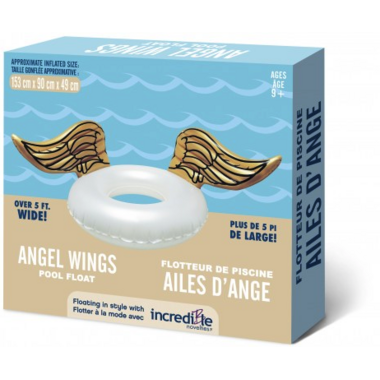 Only use in shallow water under competent and direct adult supervision. Bigger than I thought! Kids love it!